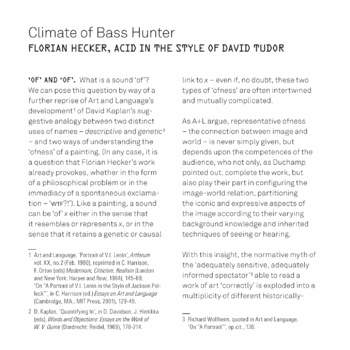 Sleevenotes for Florian Hecker, Acid in the Style of David Tudor (Editions Mego). ‘OF’ AND ‘OF’. What is a sound ‘of’? We can pose this question by way of a further reprise of Art and Language’s development1 of David Kaplan’s suggestive analogy between two distinct uses of names – descriptive and genetic2 – and two ways of understanding the ‘ofness’ of a painting. (In any case, it is a question that Florian Hecker’s work already provokes, whether in the form of a philosophical problem or in the immediacy of a spontaneous exclamation – ‘WTF?!’). Like a painting, a sound can be ‘of’ x either in the sense that it resembles or represents x, or in the sense that it retains a genetic or causal link to x – even if, no doubt, these two types of ‘ofness’ are often intertwined and mutually complicated. As A+L argue, representative ofness – the connection between image and world – is never simply given, but depends upon the competences of the audience, who not only, as Duchamp pointed out, complete the work, but also play their part in configuring the image-world relation, partitioning the iconic and expressive aspects of the image according to their varying background knowledge and inherited techniques of seeing or hearing. With this insight, the normative myth of the ‘adequately sensitive, adequately informed spectator’3 able to read a work of art ‘correctly’ is exploded into a multiplicity of different historically-situated image-world relations. Does this prevent us from setting the boundary conditions for a ‘competent’ reading, consigning us to relativity and the impossibility of any critical discourse on what a picture or a sound is ‘of’?4 Not, suggest A+L, if we admit that representational ofness is parasitic upon genetic ofness. For then criticism would be re-grounded in the ability to detect and analyse the genetic bases of the work, and realism in techniques that clearly circumscribe the relation of the work to its genesis. Accordingly, against the notion that the ‘meaning’ of a work can be read off from its iconic content, the suppression of information about the generation of a work would only block access to a full sense of what it is ‘of’, in what A+L argue is ultimately an ideological obfuscation. Although preceded by comparable mechanical devices such as the planimeter and integrator – physical embodiments of mathematical techniques simulating a system governed by a differential equation, and designed to interact directly with continuouslyvarying physical quantities16 – postwar analog computing emerged from the development of military control mechanisms. The incomparable success of electrical flux as a physical analog of the continuously-varying quantities of calculus, and analog systems’ consequent facility in solving differential equations and so simulating dynamical systems at a time when digital computers were taking their first baby-steps toward simple arithmetic, were swiftly seized upon by a nascent military-industrial complex. In the early twentieth century, tactical dominance had become less a matter of brute force than one of ‘information technologies’ in the broad sense. And just as, even in default of any satisfactory mathematical foundation, early differential calculus had immediately been put to work in directing cannonfire, early analog computers would be eagerly deployed in the preparation of ballistics tables, in aeronautical and missile design, and in conducting ‘virtual laboratory experiments’ where real-world fi eld trials would have been prohibitively expensive or dangerous. market made its will known against the intransigent analog bias of a man like Roland president Ikutaro Kakehashin. Completing the transfer of military-industrial technology to the burgeoning media-entertainment complex, Kakehashin oversaw the production of Roland’s 303, a bass guitar simulator which, famously, failed miserably in the marketplace, and found belated success only years after being discontinued, when producers misused the controls intended to fi ne-tune the simulated bass guitar, instead tweaking the 303’s voltage control filters to explore an abstract sonic space. The 303 inadvertently released, as a kind of ‘machinic surplus value’, the possibility of a variation-in-motion: The parameters that were meant to be adjusted judiciously to achieve a serviceable representation were instead tweaked ‘in-flight’ to create outrageous sounds abstracted from all resemblance to any earthly musical instrument. LANDSCAPE AND CLIMATE. In realising this machinic surplus value, rather than analogizing real processes these pioneers explored the entire sonic space laid open by the device. They became bass hunters in a virtual smooth space, where the hypnotic patterns of acid house formed refrains, repeating paths, filters sweeping them across the terrain of continuous variation. restricted sonic territory; they also release the analog synth from this habitual retreading of hunting-grounds governed by human proclivities. Instead, they reveal to us the weather-patterns native to this space. Climatic systems are the paradigmatic example of chaotic systems: Sensitivity to initial conditions, nonlinearity, massive complexity, emergent properties, deterministic but formally unpredictable turbulence. But equally, every chaotic system develops a climate within the mathematical space over which it operates. It is such climates of continuous mathematical space that Hecker exhibits to us – climate as the differential of weather, or the mobile differential tendency of tendencies. 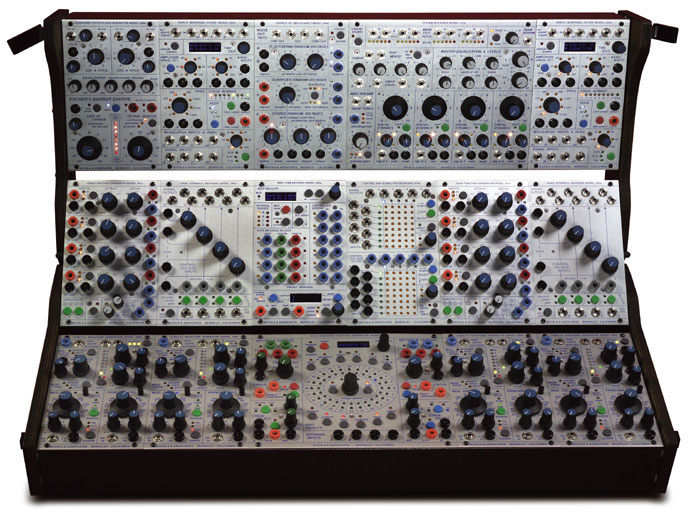 Returning analog synthesis to its roots in the simulation of differential equations, Hecker hystericises a Buchla synth by patching it to a Comdyna analog computer, using cross-coupled modules sensitive to the input signal’s gain and capable of producing frequencies not present at the filter input. This cross-coupling induces positive feedback paths, yielding a volatile, nonlinear climate in which we hear the material of sound yawing, rolling, and folding in on itself. As with the experiments in Auditory Scene Analysis23 interleaved with Hecker’s acid trax, these sounds vacillate on the edge of objectality, enigmatically quasi-cyclical, integrated and yet protoplasmic…. What is a sound ‘of’? What is a sound? The landscape is subjected to a mobile differentiation; weatherfronts approach and pass, meteorological catastrophes play out in a turbulent atmosphere. ACID AND TUDOR. If ‘acid house bypassed verbals altogether and proceeded to what felt like direct possession of the nervous system via the bass-biology interface’,24 Hecker undertakes to scour away the residual fi gure of the human, brutally deterritorialising the landscape with his inclement climate changes. Acid and rave culture had operated an escape from physical analogy but only to become lodged in a more profound complicity with a pharmacologically-morphed image of the human (dance and bi-lateral symmetry, the mutual catalysis of electrocortical stimulation and the effects of amplifi ed sound). Whereas on the other side of the dilemma, David Tudor’s Neural Synthesis – perhaps the piece closest to Hecker’s Acid…, and which allowed us to hear the slurping and screaming of neurons – still used its advanced (digital) technologies to operate an analogy. Representational ‘ofness’ demands further incapacitation, a further effort. The titular joke, of course, is that the turbulent adventures of these chaotic patterns seem to ape the metallic, nasal yelps of a 303 gone psychotic, the irresistible associations of its elastic, corrosive analog squawk giving rise to ‘an ironic stylistic détente between supposedly incompatible aesthetic and ideological worlds’25 of the sort that A+L proposed with their ‘Portraits of V.I. Lenin in the Style of Jackson Pollock’. So that although, in line with Hecker’s abrasive hypermodernist agenda, Acid in the Style of David Tudor is governed by an absolute ‘genetic realism’, it simultaneously brings into play an ironic ‘resemblance’: In returning to the virtual laboratory environment of the analog synth, Hecker discovers the ‘single and synchronous surface’ upon which ‘incommensurable mythologies’ – those of rave culture and high musical modernism – can be ‘forced into momentary coexistence.’26 Nothing could be more apt for an artist such as Hecker, as steeped in the chill air of Darmstadt as he is passionate about the affective power of the bass rig (as anyone attending his live performances will know). And in fact, upon retrospective examination, don’t the baroque, psychedelic visualisations of mandelbrot sets that graced many a rave flyer seem to augur this ‘monstrous détente’,27 indicating before the fact the strange conjunction to which Hecker introduces us? Their image-exploitation is suggestive in regard to the ecstasy experience, ‘infused with an intensity of meaning’,28 operating within an imaginary of spontaneous, tribal unity, and its production of a collective representational ‘ofness’ that obscured more profound genetic continuities: Possibly as few ravers suspected their phuture sounds were descended from military hardware as appreciated the mathematical significance of the paisley-patterned fractals that stimulated their visuals. SENSE AND NONSENSE. The audible continuum may be operationalised as a continuous mathematical space. But at the same time it is also the aeonic plane where infi nitives dwell: to cackle, to rush, to gasp, to whirr, to click, each one describes a vague but defi nable set of routes upon the virtual surface of sound. With exponentially-accelerating digital technology finally able to produce ‘digital analogies’ such as the BassStation and Rebirth, over the last decade basshunting has been taken up with renewed enthusiasm, and new territories have proliferated: Dread bass, rude bass, sick bass … language struggling to catch up, and sometimes lapsing into proper names, like fl ags planted in the sonic soil: Basses ‘signed’ Doc Scott, Ray Keith, Ed Rush. is required to be competent in ‘second-order’ discourses,31 and that the supposedly spontaneous fi rst-order experience of art is never as simple and unmediated as might be supposed. But the experimental suppression of aesthetic criteria ended up producing a ‘new aesthetic’:32 In the process of impassively manufacturing the Lenin/Pollock ‘portraits’, A+L ‘discovered that some were better than others’ and found themselves engaged in some kind of fi rst-order practice after all.33 It seems that however effi ciently evacuated, ‘content’ can still enter by the backdoor. Second-order conceptuality leaks out into fi rst-order content, transforming it, crystallizing into ‘a transformed aesthetic practice’.34 Similarly, do not doubt that Hecker has meticulously selected, edited, and spliced the results of his chaotic experiments in order to present us with the dramatis personae of Acid in the Style of David Tudor. But far from invalidating the genetic approach to ‘ofness’, the novelty of this continual supplementary production – the end products of an austere break from first-order ofness becoming once again ‘first-order productions of a kind’35 (but of what kind?) – demonstrates the break’s productive, stratifying or differentiating power. This unanticipated experimental outcome can be considered in terms of the famous Bergsonian dichotomy between space and duration, between the analytical mind’s spatialisation or mathematicisation of phenomena and the lived aesthetic experience of duration whose dense coagulation donates sense or meaning; between the interior ‘ofness’ of lived experience that conditions judgments of representation, and the genetic ‘ofness’ of the physical causality of sound. Against the psychophysics of his contemporaries such as Helmholtz and Fechner, Bergson denied the adequacy of the waveforms described by science to the lived experience of sound, of which they could, he insisted, only ever be an external and abstract index.36 Not coincidentally, it was against the legacy of Bergsonism that Bachelard directed his analysis of science as a series of ‘epistemological breaks’ from the self-sufficiency of the ‘immediate givens of consciousness’, an analysis to be radicalised by Althusser into the militant struggle of science against the obfuscatory mire of ‘spontaneous’ ideology. But, as we learn from A+L’s Lenin/Pollock experience, such second-order scientific breaks, with their associated techniques, obdurately and stealthily (‘[…] sneaked up on us […]’)37 give rise to new aesthetic experiences poised on the borders of sense. In discussing the dilemma of the ‘two realisms’ which the Lenin/Pollock détente set out to dramatise – that of the ideological delusions of post-painterly purity (the painting is ‘of’ the internal energy of the heroic artist) and socialist realism (the painting is ‘of’ an objective social reality) – A+L indicate that the turn toward genetic ofness offers no simple synthesis or resolution of this polarity, but instead furnishes the programme for an experimental ‘collision’38 that forces open the problem, simultaneously releasing a new bloc of aesthetic energy: ‘Action in the face of dilemma involves commitment to a more-or-less unpredictable outcome’:39 A clinical cut into the body of sound at the site of an impossible conjuncture, a sensory experience ‘wrought from the world of the “unaesthetic”’ to unleash new adventures in the bass-biology interface, it is such an ‘action’ that this recording is ‘of’. Art and Language, ‘Portrait of V.I. Lenin’, Artforum 20:2 (Feb 1980), reprinted in C. Harrison, F. Orton (eds. ), Modernism, Criticism, Realism (London and New York: Harper and Row, 1984), 145–69; ‘On “A Portrait of V.I. Lenin in the Style of Jackson Pollock’, in C. Harrison (ed. ), Essays on Art and Language (Cambridge, MA: MIT Press, 2001), 129–49. D. Kaplan, ‘Quantifying In’, in D. Davidson, J. Hintikka (eds. ), Words and Objections: Essays on the Work of W.V. Quine (Dordrecht: Reidel, 1969), 178–214. Richard Wollheim, quoted in Art and Language, ‘On “A Portrait”, 130. Art and Language, ‘On “A Portrait”’, 130–31. Art and Language, ‘Portrait of V.I. Lenin’, 152. Art and Language, ‘On “A Portrait”’, 138–41. See L. Althusser, ‘Philosophy and the Spontaneous Philosophy of the Scientists’, in G. Elliot (ed), Philosophy and the Spontaneous Philosophy of the Scientists and Other Essays (London: Verso, 1990), 69–165. Art and Language, ‘Portrait of V.I. Lenin’, 146. See A. Badiou, ‘Marque et manque: à propos de zero’, in Cahiers pour l’analyse, vol 10 (1969), 150–73. Art and Language, ‘Portrait of V.I. Lenin’, 154. Art and Language, ‘On “A Portrait”’, 149. C. Care, ‘A Chronology of Analog Computing’, The Rutherford Journal, vol. 2 (2006–7), at http://www.rutherfordjournal.org/article020106.html. J.S. Small, The Analog Alternative: The Electronic Analog Computer in Britain and the USA, 1930–1975 (London: Routledge, 2001), 33–5. D. Slater, ‘Chaotic Sound Synthesis’, in Computer Music Journal 22:2 (Summer 1998), 12–19. See R. Spiess, ‘The Comdyna GP-6 Analog Computer: Alive But Not Exactly Kicking’, in IEEE Control Systems Magazine 25:3 (June 2005), 68–73, for a reflection on the continuing value of the analog computer in engineering education. T.J. Pinch and F. Trocco, Analog Days: The Invention and Impact of the Moog Synthesizer (Cambridge, MA: Harvard University Press), 28. S. Reynolds, Generation Ecstasy: Into the World of Techno and Rave Culture (London and New York: Routledge, 1991), 37–8. See A. Bregman, Auditory Scene Analysis (Cambridge, MA: MIT Press, 1990). Art and Language, ‘On “A Portrait”’, 132. Art and Language, ‘On “A Portrait”’, 5. See H. Bergson, Time and Freewill: An Essay on the Immediate Data of Consciousness, trans. F.L. Pogson (New York: Dover, 2001). Art and Language, ‘On “A Portrait”’, 146.